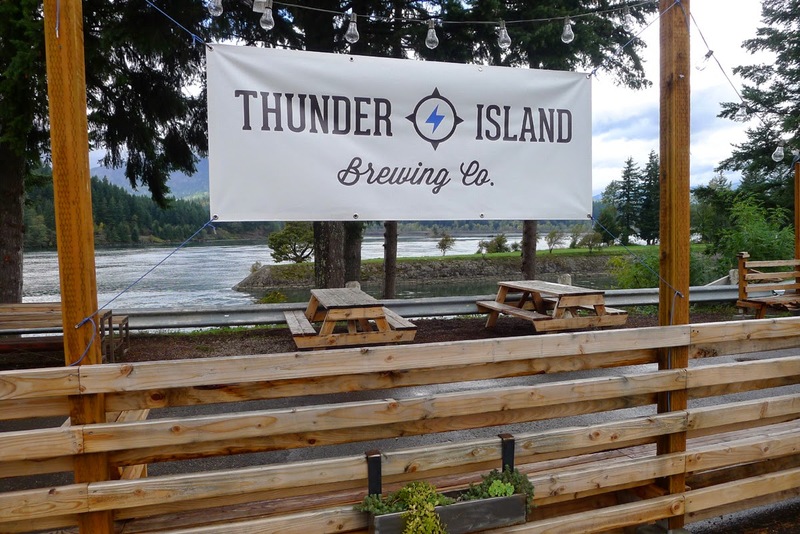 Thunder Island Brewing in Cascade Locks is an idea whose time is exactly right. They celebrated their first anniversary the other day and it was evidently a great first year. The time is right because the sleepy little town of Cascade Locks is growing up. A brewery is a nice thing to have. I stopped in the other day on a drive out to Hood River. It wasn't a great day, but it's pretty clear to me that Thunder Island chose an ideal location. The brewery/pub sits on the edge of the Columbia River and the views from their patio are terrific. This place opened a year ago on a two-barrel system in a renovated industrial space. Founders Dave Lipps and Dan Hynes figured the brewery and space would meet their needs for a while. As so often happens in this industry, they were wrong and soon found themselves unable to keep up with demand. "Things were bonkers for us during the summer," the gal behind the bar told me. "We had a constant flow of people. It was beyond our expectations." Thanks largely to the craziness, they launched a plan to transition to a seven-barrel system with several larger fermenters. They had some technical issues and a small fire tossed a monkey wrench into that plan. Beer production is limited at the moment. I spent an hour talking to Hynes, Thunder Island's brewer. He said they would normally have three or four of their beers on. Production issues had reduced the count to one, a nice Scotch Porter once it warmed up. Guest handles were occupied by beers from Backwoods Brewing, including a terrific IRA, and some ciders. "This definitely isn't what you're usually going to find here," Hynes said. They typically offer a Kolsch, a pale ale and an IPA to go with the Scotch Porter. Seasonal and specialty beers are also part of the mix and I'll have more to say about that in a moment. Hynes is a young guy, and passionate about beer. 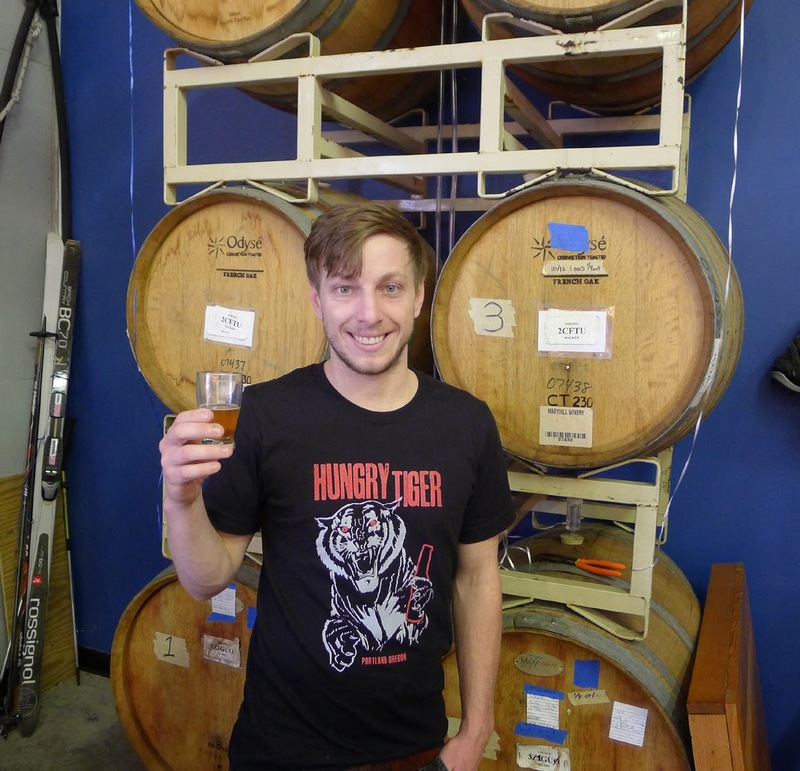 He has no formal brewing training, but has bounced around the Portland beer and homebrewing scene for years and knows the ropes. He and his partner decided to open in Cascade Locks because the business community was receptive and inviting. Brilliant. The Gorge is a destination. Multnomah Falls is just down the road. 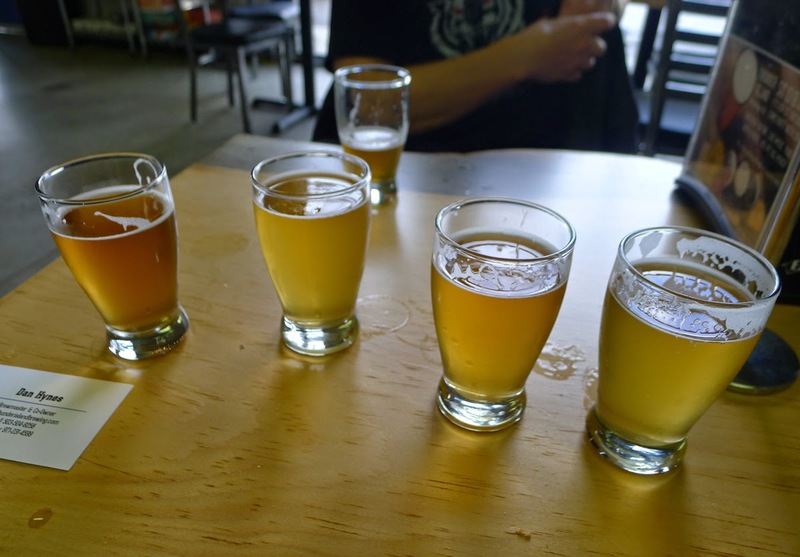 There are hiking and biking trails and all kinds of recreation A brewery is a perfect fit here. Being located a short distance from the freeway in a protected, scenic spot makes the place easily accessible and friendly. If you're wondering, Thunder Island Brewing is not located on Thunder Island. That would have been a nice touch, but also logistically difficult. Take a look at the map. The brewery and patio actually overlook Thunder Island, which isn't half bad. When the place opened, they were open limited hours and had no food, outside of a food cart. Not an unusual arrangement. The food issue meant minors were not allowed in what was then a tasting room. That's been fixed. Today, they have a kitchen and decent pub menu. Hours have been expanded. Kiddos are welcome. Bingo. They aren't strictly interested in standard beer styles. 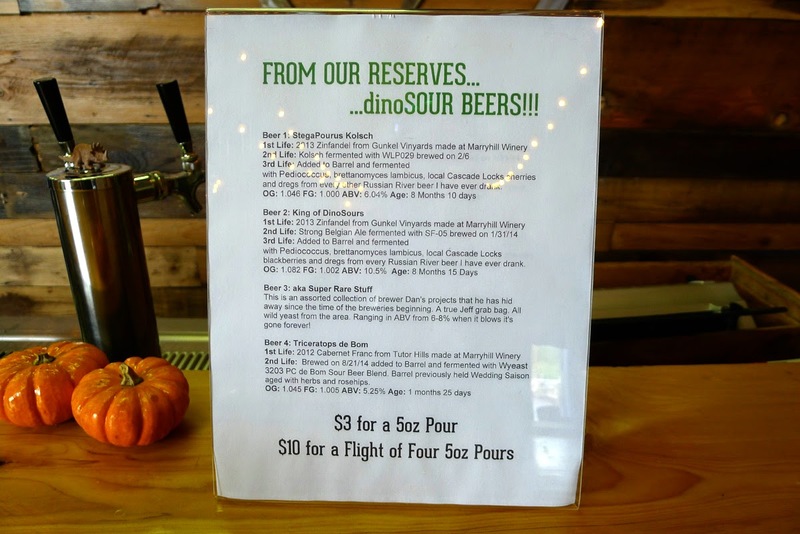 Hynes has a small barrel program in place and they had four "dinoSOUR" beers on. I sampled the beers as we talked. None of them has aged long enough be considered truly finished. But they are pretty good and worth trying if you like sour/wild beers. Obviously, the supply of these beers is limited and they won't be on long. Travel through the Gorge is will be a little less relaxed as we move into the darker, wetter, cooler months. At Thunder Island Brewing, they will probably see fewer patrons over the winter. 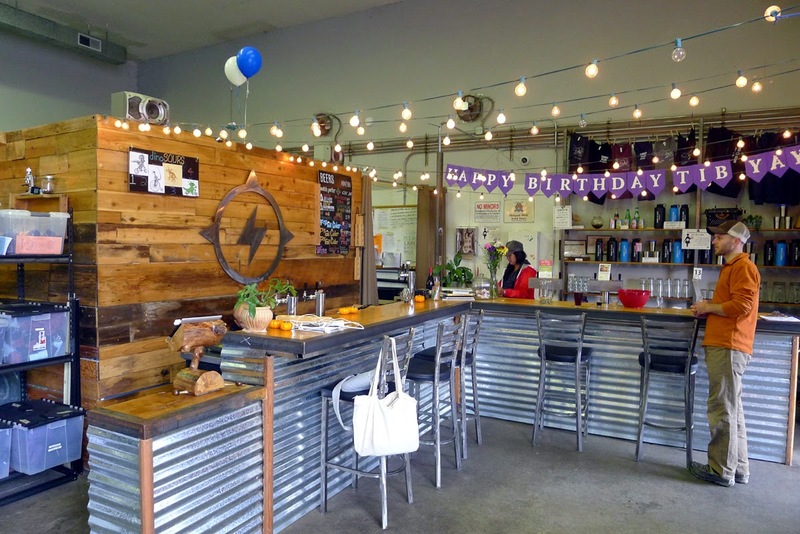 But add this little brewery to your bucket list of places to visit in the Gorge. You won't regret it.